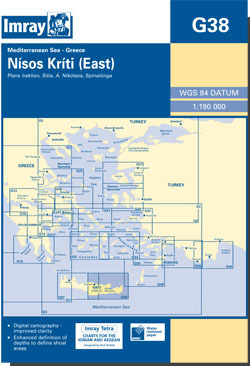 The eastern portion of the island of Nisos Kriti (Crete). Scale: 1 : 193.000. Larger scale plans of Iraklion, Stia, Aghios Nikolaos, Ierapetra, Kaloi Limenes, Khersonisos. On this 2015 edition harbour developments and more recent survey data are shown at Áyios Nikólaos and Sitía.